Whisk all ingredients together in a large bowl. Store in an airtight container until ready to use. To gift, you’ll need two pint jars with a screw-top lid. Place two cups of waffle mixture in each jar. Place waffle mix in a large bowl. Stir in wet ingredients and mix until well incorporated. 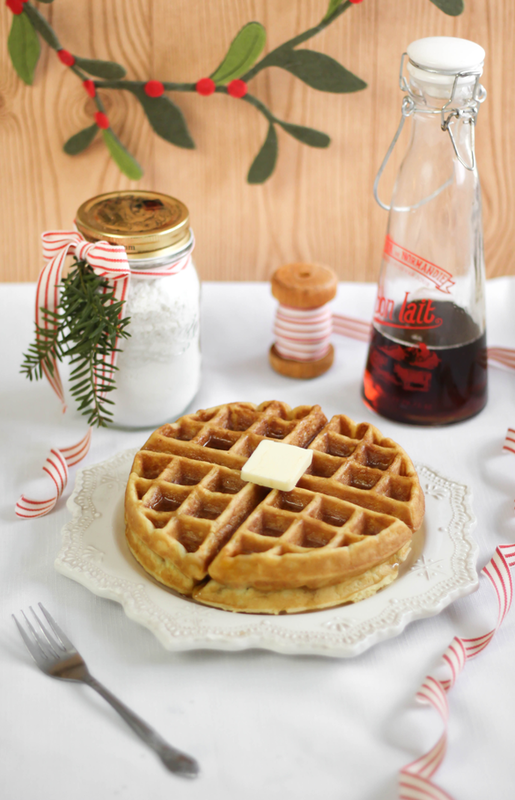 Pour batter into a heated and buttered waffle iron (capacities will vary). Cook for 5 minutes or until waffles are golden. Notes: When I take this mix to-go, I include a vanilla bean in each jar of mix. Although it’s not necessary, I enjoy the extra layer of flavor. The bean can be split and scraped then added in with the wet ingredients. Buttermilk substitute – 1 cup sour cream mixed with 1/2 cup whole milk.